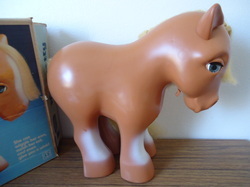 This pony was released in 1981 and is not an official My Little Pony. 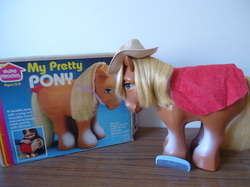 She was produced by Romper Room, wich was part of Hasbro that later that year took over the production of My Pretty Pony. The brown one is the first released and later they did a peachy colored wich have heart symbols on her hip and looks a lot like My Little Pony Peachy!